I am a first-generation Italian-American. My mother was born in the small Comune of Picinisco in Frosinone Italy and my grandparents were married there before sailing to America in 1926. Our lineage on my grandmother’s side dates to 1597 with our ancestors being from this small town. Over the years, my mother kept in touch with a few relatives by exchanging letters and sharing important milestones. She also kept our Italian traditions alive and made sure everyone was well fed. My mother has since passed, and I so wish she could have experienced the beautiful village in the hills above the Comino Valley. To do my part to cultivate a stronger appreciation of our heritage, I planned a trip with my children to Italy which of course included visiting Picinisco! Before leaving, I completed an Ancestry DNA test and met an unknown cousin from California who not only shared our family tree which he had been working on for over 20 years but made me aware of a research company in Frosinone Italy that could help me obtain more historical information, and possibly locate relatives. I quickly contacted Ann Tatangelo of Angel Research and they began researching my family. Together all of us walked straight up the narrow-stoned pathway and there in front of us was the home of my grandmother and her family with the name plate still on the door! We could not believe our eyes. The next divine appointment was with Liberata, an older woman who was sitting on her step across the street. Our guide Rita, spoke with her in Italian and learned she was their cleaning lady. I showed her the photos I had, and she knew most everyone by name. She said some of our relatives would be visiting next month and that she would have them get in touch with me. I left a photo of a little girl wearing her first communion dress with the announcement and my contact information. In the following moments, the sky darkened the grounds of the cemetery and under erupted along with rain drops the size of quarters. Quickly we all ran and jumped in Rita’s car. Exhilarated, excited does not adequately express what an incredible and meaningful day this was for me and my family. As we drove down the mountain with an expansive view before us back to the train station, I did not want to leave. I wanted to stay in this quaint and magical place that last year celebrated its 1000th anniversary and learn more about my family. As we headed back to Rome, which is where I learned my relatives migrated to, I did not want to give up hope in finding them. I asked Ann and Rita about continuing the research and they said it could be done but would be very challenging. 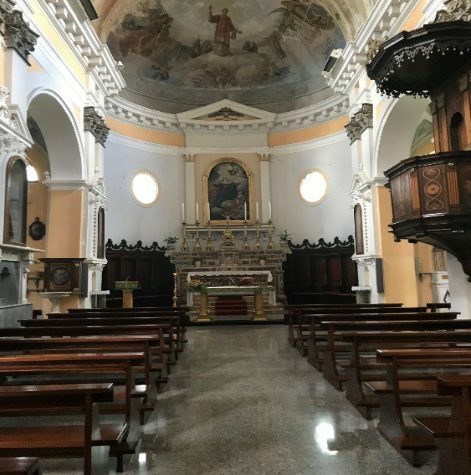 The next day, I attended mass at Santa Maria Maggiore and while I sat in the pew I thought about all I had experienced in Picinisco. I thought about my grandmother, Anna who never saw her family or home again and my mother, Margherita who never saw her birthplace. As tears welled up in my eyes, I thought to myself, I did. And my kids did. I am so grateful. Upon returning to the monastery where I was staying, I asked the woman at the front desk if she knew any one with my family’s last name and unexpectedly she said yes! I forwarded her the photos of the tombstones I had taken the day before and she sent them. In moments her friend responded, “Oh my gosh… that’s my family!” That night, my second cousin quickly arrived at the monastery to meet me. We were both emotional and filled with joy. She couldn’t believe I found her and I too couldn’t believe I found her. In all of Rome I stayed at the place I was meant to stay and asked the right person. Another divine appointment. Two nights later, I had dinner with two of my 2nd cousins at the home of my grandmother’s nephew, my 1st cousin once removed and his wife and son. Before my cousin picked me up, she sent a text asking if I was ready to meet “My new Italian family?” When I arrived and entered their home, there on the wall was the family crest along with what I later learned that evening were many furnishings from the family home in Picinisco. For hours we talked and shared stories with one another and dined over a magnificent meal complete with wine, Moscato and Prosecco. The night was the perfect ending of my initial journey in finding and connecting with relatives who embraced and welcomed me into their home. A few weeks later, the little girl in the photo wearing her communion dress contacted Rita by phone and indicated how astonished she was to see the photo and learn of my visit. She quickly emailed me and expressed her excitement and interest in learning more about my mother, her cousin, and my grandmother, her aunt. Visiting Italy and seeing all the beautiful and historical sights this summer with my children was an experience I will always cherish. Being with them and seeing where my mother and ancestors are from meant more than I can convey with words. 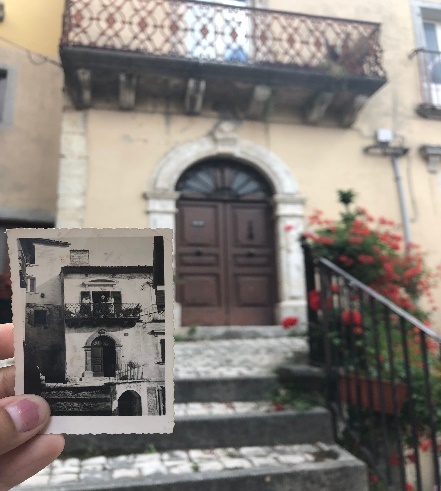 As I continue to discover more about my family heritage and gain a better understanding of the loved ones in our past, it is my hope that my journey and story will be shared with future generations and that they too will keep the Storia di Picinisco alive. ← How professionals work together. Wow ! What a wonderful story! And remarkable that you happened to stay where you did, and what followed as a result. Congratulations, how exciting! My path has been filled with brick walls, but your story has been inspiring.